This large Jewelry Armoire is very similar to our ND8421ARMLCOF. 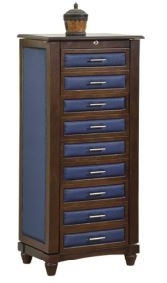 It is trimmed in cushion, but has 9 drawers; it is as equally beautiful with large amounts of storage. A large mirror in the lift lid covers a locking top storage area which is divided and has enough ring rolls for the largest ring collector. 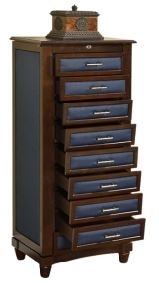 The top 2 drawers are divided (4 and 2), and the remaining drawers are open space for bracelets and bedside delicates. The entire interior is fully lined. The cushion design is luxurious cloth with thick padding that is spot & rip resistant. 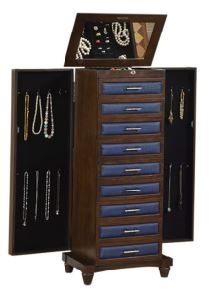 The side necklace cabinets are also lined and with 8 large necklace hooks. The color is coffee finish, deep blue cloth, and black lining. Measures 19" wide, 13" deep, and 44 1/2" high. And don't forget: the top locks (but not the drawers or sides). Quality Assurance 1 Year Warranty: This jewelry armoire has a one year warranty which covers manufacturer defect and inferior workmanship. If within one year of normal use it is found to be defective, please contact customer service with specific details about the problem and we will assist you with an exchange replacement from the manufacturer. We want you to be happy with your item and shopping experience. In the event an item arrives damaged, we assist with prompt pick up and replacement. If for any other reason you are not completely satisfied, please contact us within 30 days for an item cost refund. Items must be in new, unused condition and original product packaging is required for an item cost refund upon our receipt of the item. Re-stocking fee may apply. Cushion Side Design Jewelry Armoire, 8 Drawers White Curved Standing Jewelry Cabinet Armoire with Five Drawers Front Opening Dark Walnut Standing Jewelry Armoire Queen Anne Ivory Whitewash Wood Jewelry Armoire. Floor Standing Girls Jewelry Box.